Help a brother and sister return home in Katy and Bob - Way Back Home, a quirky culinary adventure. Katy and Bob have spent much of their lives sipping drinks and laying by the poolside while their father runs the family business. He thinks that it's about time the two youngsters learned the art of self reliance and soon sends them off on an adventure that will do just that. Giving them a one-way ticket, they will have to fend for themselves to earn enough money and get back home. Join Katy and Bob on this unexpected adventure as they figure out how to make ends meet and pay their way back. 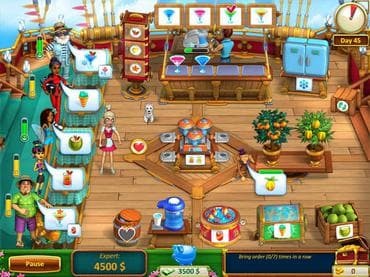 Test your skills as you help them prepare food, cocktails, and more for patrons of a tropical bar. Entertain customers with breathtaking fireworks, grow fruits to make juice, and purchase upgrades to earn even more. Will they learn their lesson? Download free full version game today and find it out. If you have questions about Katy and Bob - Way Back Home game, please contact us using this form.